Jeremy Gustafson is deep into cover crops—and gets a little deeper each year. 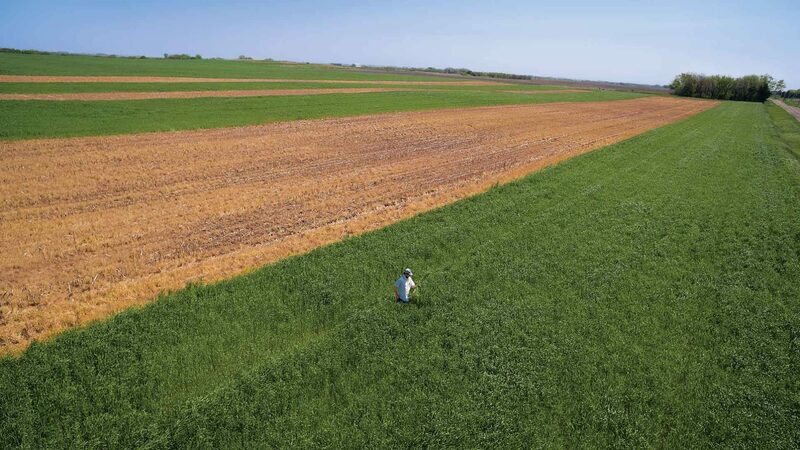 “If you would have asked me a few years ago if I would be planting soybeans into 3-foot-tall cereal rye, I would have told you ‘No way,’” he says. But that’s what he was doing when spring rolled around in 2016 on his Boone County, Iowa, family farm. Gustafson is a farmer-cooperator working with Practical Farmers of Iowa to conduct strip trials that compare termination dates of cereal rye ahead of a soybean crop. Going deep. Results from the first two years of this study show that farmers may be able to delay termination date and plant green—deep green—without hurting yield in the subsequent soybean crop. In 2014 and 2015, trials involved no-till planting or drilling soybeans into either an early (two weeks prior) or late (a day before or after soybean planting) cereal rye termination date. Two of the three farms found no statistical difference in soybean yields following delayed termination. Gustafson found no statistical difference in yield between early and late terminated treatments. In Tama County, Jack Boyer saw no statistical difference between early and late termination dates, as soybeans under both treatment programs yielded about 70 bushels per acre. However, he did observe a big advantage in weed control for the delayed termination.